Google Photos – Page 2 – Learn Picasa and Google Photos! 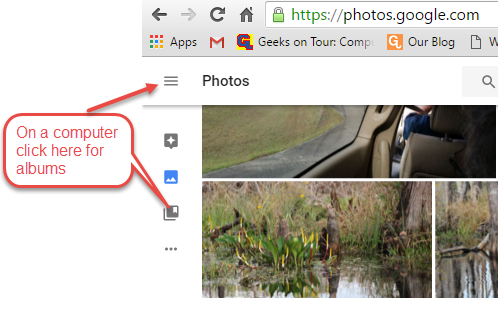 Photos on your computer, or photos on your Cloud account? In my world, those two concepts are swapping places. I am transitioning from being computer-centric to being cloud-centric. There are 2 reasons for this transition. First, the sheer volume of pictures we take with our smartphones is overwhelming – we need an automatic way of dealing with them or they will simply get lost. There are not enough hours in the day to get those photos to the computer and organize them! 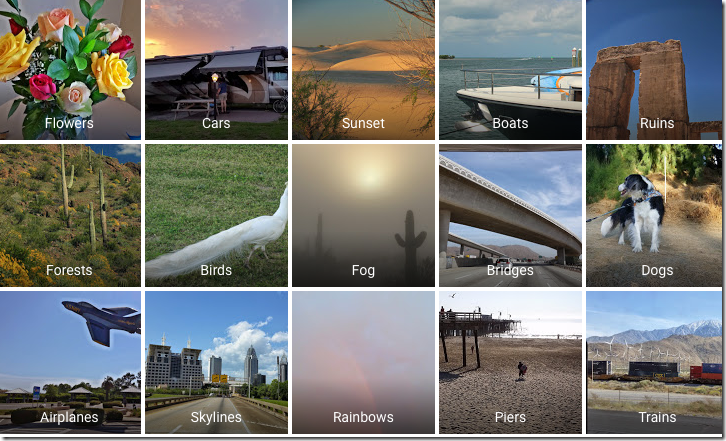 Secondly, Google is redesigning their photo tools. They’re giving us free online storage for an unlimited number of pictures so let’s take advantage of it. 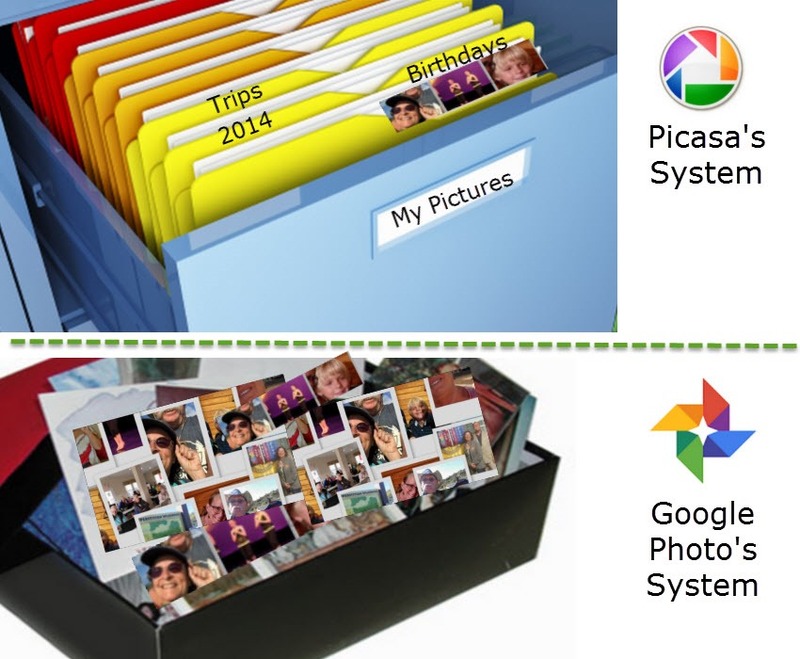 Google sees the future more clearly than most of us, and the future of photo storage is all online. 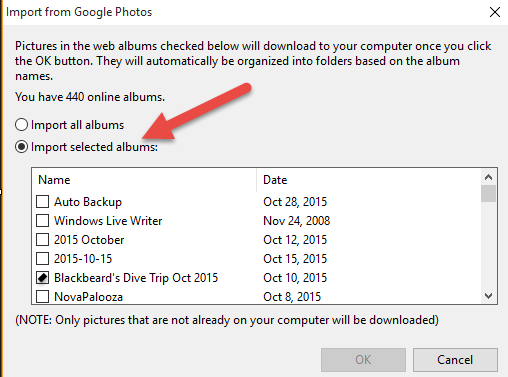 I used to keep all my photos on my computer – I call that my Master Library. I captioned, edited and organized them, using Picasa, all on my computer. Then I uploaded only those best photos that I wanted to share with friends and family. My computer (and external hard drive) held thousands of photos – all my originals. 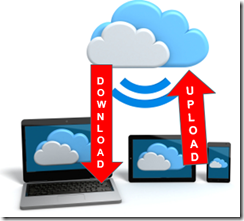 My online (cloud) account held hundreds – just the best ones. Now I take most of my pictures with my phone and those pictures can automatically be uploaded (aka backed up) to my online account in the cloud. 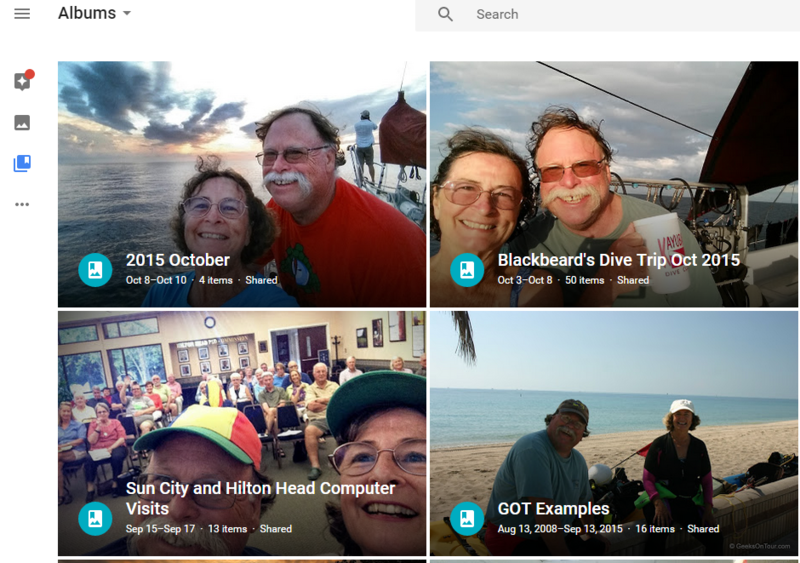 Using Google Photos, I can edit and organize them all in the cloud – no computer necessary at all! I can pick my best pictures and make online albums with just those pictures that I want to share. My private, cloud-based (online), account now holds the thousands of pictures I take and separate shared albums hold my best. 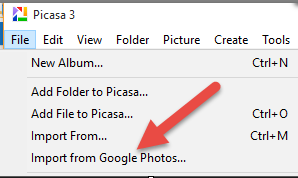 If I want pictures on my computer, I can download just those best ones in the shared albums. Change is hard. 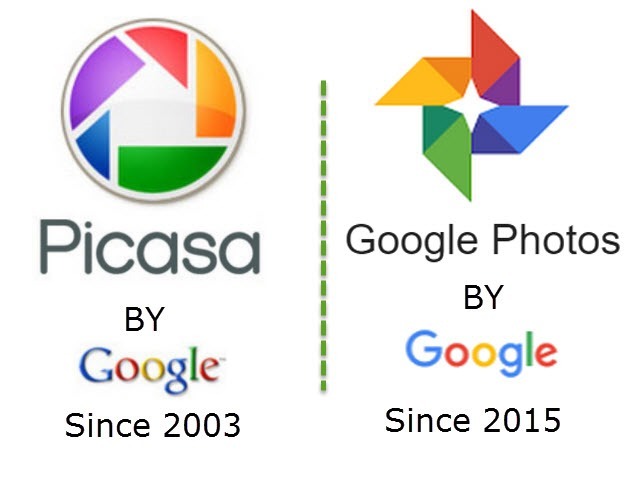 I’ve had a workflow procedure for the last 5 years that works great, I collected all pictures on my computer where I used Picasa to pick and edit the best ones and then upload. The only difficult part was getting the pictures from my phone to the computer and that was handled pretty nicely with Dropbox. The new procedure is easy. Photos automatically go to your account in the cloud, using Google’s high resolution setting you have unlimited storage space for free. All your photos – I call it my Master Library – are available for viewing from any device and Google gives you many wonderful ways to just see what you want. The problem is that there a few pieces missing. And, some of those pieces are very important to me. 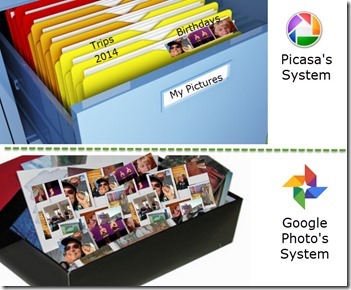 It’s automatic – no work involved to collect pictures from multiple mobile devices. They all go to your Google account, a private photo-warehouse in the cloud. 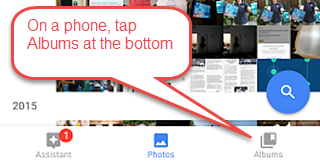 Google tools for viewing your photos are amazing. Search for anything you want to see and Google instantly finds them from your thousands of pictures. Your pictures are instantly shareable because they’re already online. Basic editing tools actually do a better job than Picasa, and there are even better tools in the companion Snapseed app. 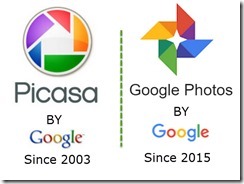 Picasa capabilities missing in Google Photos: captions, watermark, visual indicator for best pictures, text on picture. Captions is the most critical to me. Changing my workflow is a work in process while I get used to Google Photos. 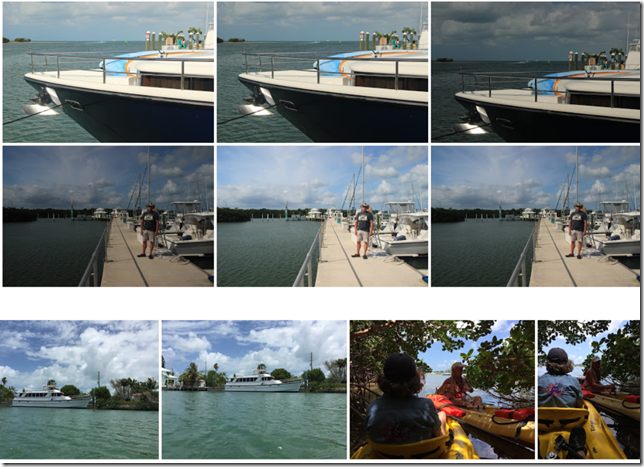 The new features of Google Photos are just SO good, I must use it, so I need to find work-arounds for the things I am missing. Please use the comments below to let me know what you think.